How accurate are you at throwing Frisbees? 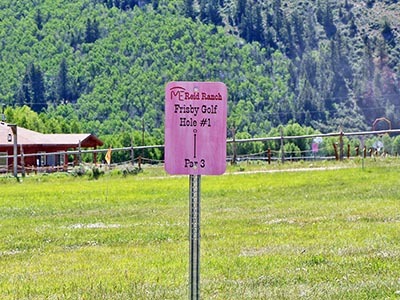 The Frisbee Golf game is played by throwing the Frisbee toward and eventually through a standing hoop or “hole.” There are nine such hoops around the ranch grounds. Frisbees can be checked out at the Trading Post and score cards are provided that give directions where to start and end each “hole” with a par (or number of throws it should take to get the Frisbee through the hoop).